Thank you to everyone who left a comment on my Half-Somethings post - your replies made me chuckle, actually one or two made me laugh out loud! Despite some great advice given, I have yet to decide either way - so in the absence of any overnight progress I am showing you the lingerers. Again. Let's be honest, you've seen them before, probably several times over. The third little thingy should be finished soon so I'll save that for the Ta-dah and tell you about my latest book. The Island by Victoria Hislop is not the kind of novel I'd usually pick up, but it's this month's book club choice and I am quite enjoying it. The island of the title is Spinalonga, a leper colony off the coast of Crete - although the book (so far, at least) is set away from the island as much as it is on it. It's an easy read - the sort of thing you could finish in a few days while laying on a beach, but it is quite interesting, particularly as I came to it knowing nothing about leprosy or Cretan village life in the last century. I'll let you know whether I'd recommend it next week, when I've finished reading. That's it for now. 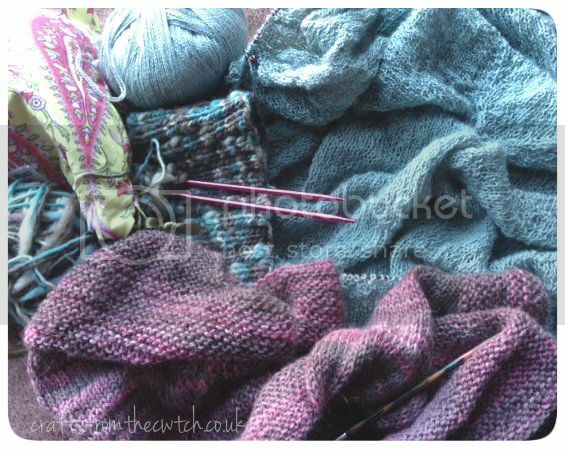 Today's links are WIP Wednesday and Yarn Along and before I go I'll remind you to pop over to the Jordana Paige 'Craft Butler Tool' Giveaway post. See you tomorrow for some more gift ideas! I loved 'The Island' and on the strength of it bought Hislop's next book, which I didn't think was as good! Uninspired...happens to us all. Usually I start something new when that happens. Beach reading should be light, something you can look around and watch the action at the pool or beach and not worry about concentrating on something going on in the book. Vacation/pool/beach time is actually about the only time I read. Generally, when I might be reading I'm knitting and or on the computer. This was me last month. I'm happy to report that the feeling past and I'm once again up to my eyeballs in Must. Knit. Now. Projects. Hope it passes quickly for you, too! It really takes motivation to work on big projects like garments and shawls. Maybe set a goal of so many rows a day and then have a small side project? I think big projects like shawls should come with warnings. "WARNING: Beware only proceed if you are not prone to boredom and like black holes. Lack of inspiration and motivation to follow after three repeats." I can't wait to see the shawl finished, I'm intrigued.. The Island?..hmm, I live over the hill from Spinalonga and the place is hauntingly wonderful. You can go and visit the island in the summer and wander around the derelict buildings and the graveyard. I've been several times and I feel emotional every time..it's very close to the mainland, you can see 'life' continuing on but the lepers were not allowed to mix. I am sure this hiatus will pass soon enough and you will be wondering what all the fuss was about! I usually try to have a couple of projects on the go, especially if I'm knitting a big project - I have to discipline myself to do a certain amount each day of the big project, and then work on the smaller one as a reward. I haven't come across the Nef Sock, but I have some Scrumptious sittng there awaiting transforming into a Christmas present, and it feels delicious!